Hi Everyone! 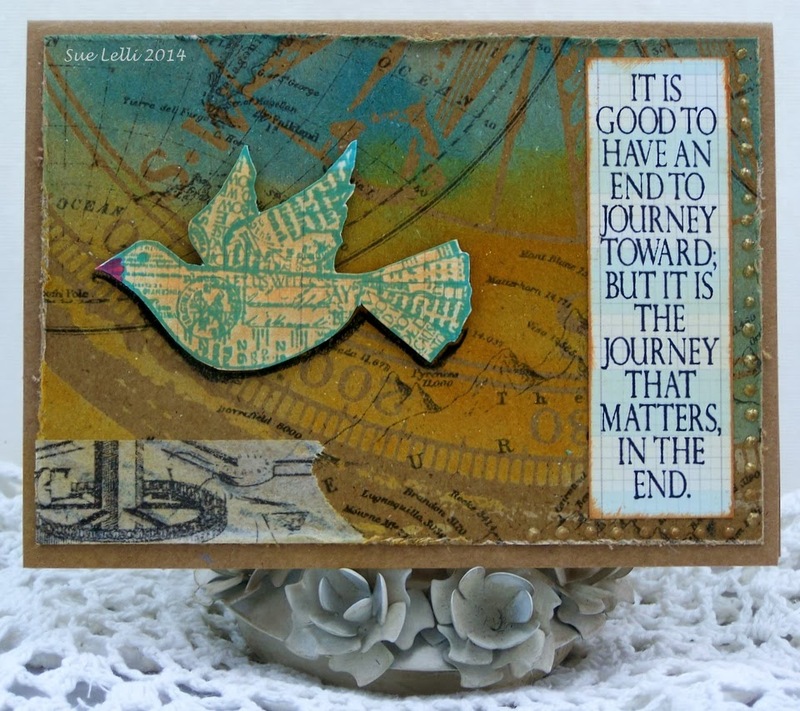 It's Sue Lelli here today playing in my journal with Tim Holtz kraft resist paper, TH Distress Inks, and my new TH Stamp Set (Stampers Anonymous), Classic 16. 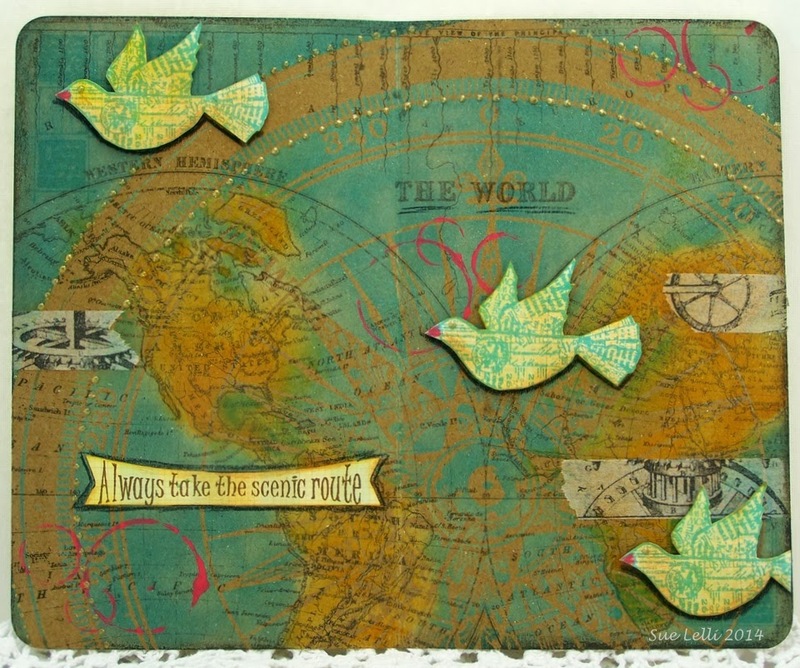 I chose to build my pages around that FAB sentiment, "Always take the Scenic Route," hence the world map. 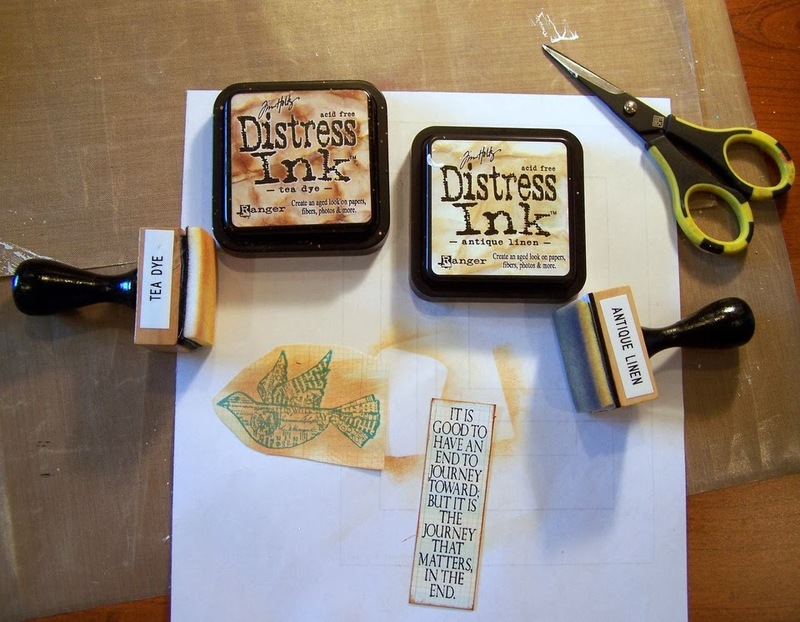 What is so cool about adding TH Distress inks to the kraft resist paper is that when you wipe it with a baby wipe, all of the ink comes off of the resist areas on the map making a very cool effect. You can probably see the resist area the best in THIS photo with the starburst. LOVE this look! 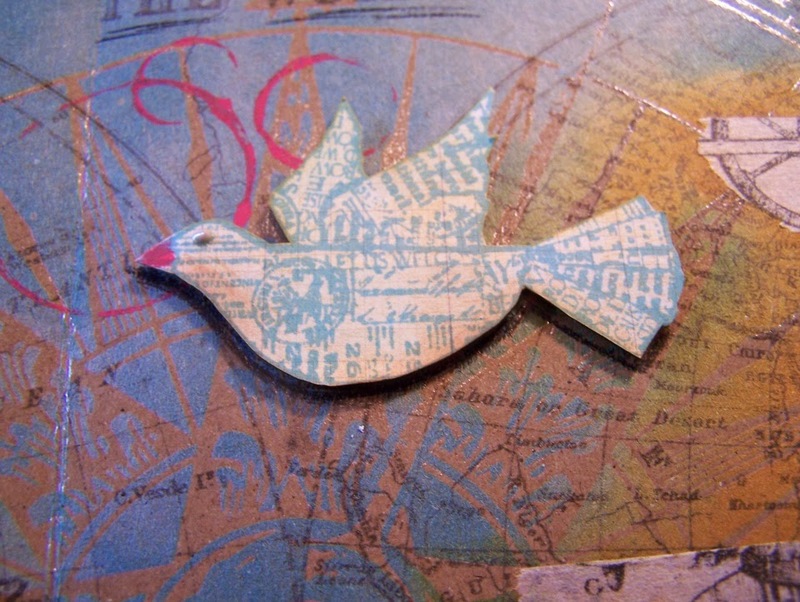 Here's a close up of the bird from this FAB stamp set. I am in LOVE with the text and patterns on the bird and didn't want to cover it up too much with ink. I did think it looked cool to make a red beak with my Faber Castell Big Brush pen to match the red circles I randomly added. I also drew a black shadow underneath the bird's belly and tail to add some depth. 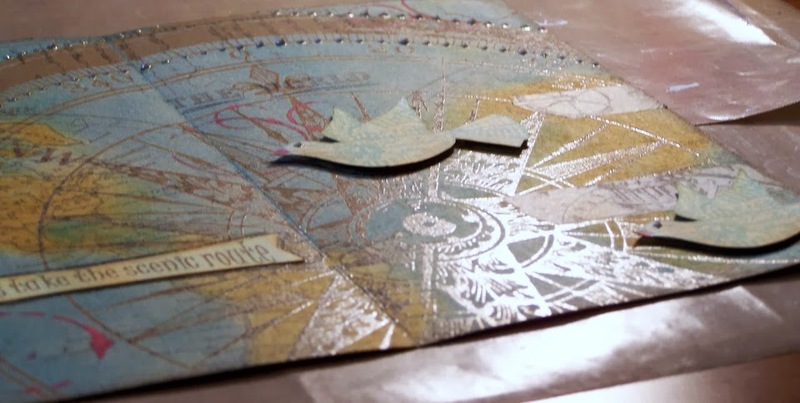 I added Art Anthology's Champagne Dimensional Crystals around two sides of the resist circle on the paper. LOVE this added texture! I also added some strips of TH tissue tape for another layer. I wanted to mention that I worked on these pages outside of the journal, then rounded the corners and glued them into pages in my Dylusions Creative Journal. What I LOVE about this particular journal is that there is no ring in the center of the pages. It is like an actual bound book plus it has an elastic band to hold it closed. Simple but masculine, I think. This shows how I applied TH Distress inks and cut the birds out. 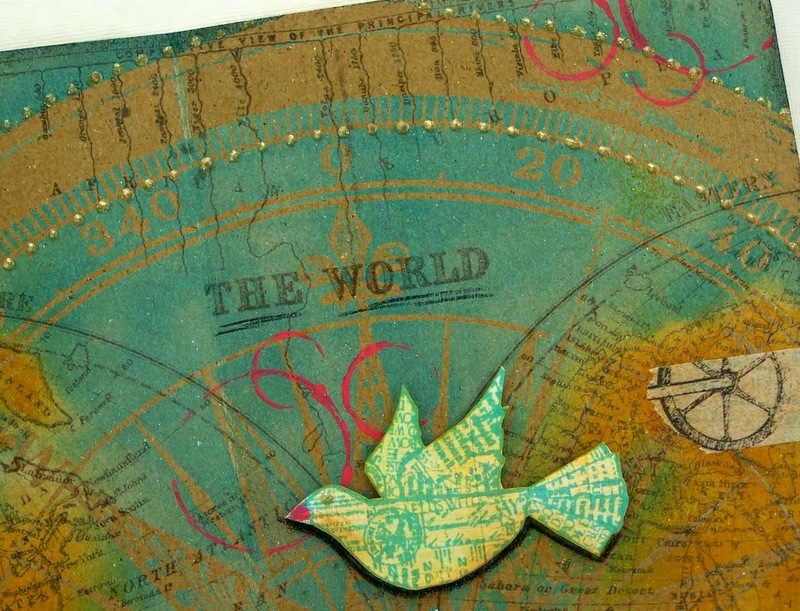 The birds were stamped with Wendy Vecchi's Archival Ink. This sentiment would be great for so many different occasions. I stamped it on a scrap piece from my Authentique Glistening paper pad and added Art Anthology Champagne Dimensional Crystals around two sides to give it oomph! Oh my giddy aunt Sue how cute are those birds...love the pages!! 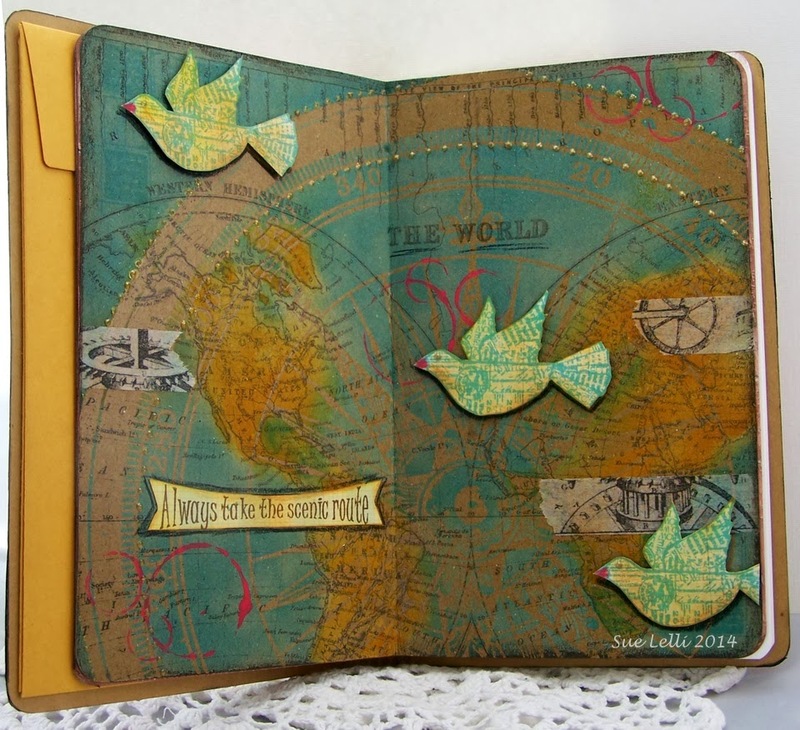 Fab use of the resist paper - it looks wonderful! ahhhhh, I was wondering about using the heavier cardstock. Awesome idea to work on these OUTSIDE of the journal. Wonderful spread and love the color. What a beautiful piece of art! Love that starburst too but those birds are beautiful. Love Is Incredible . . .